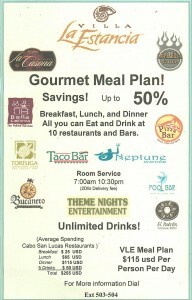 Villa La Estancia now offers owners and guests the option of a “Full Board” meal plan. Alcoholic beverages are not included (see our previous post: http://heavenincabo.com/no-longer-available-villa-la-estancia-all-inclusive-option/). The cost of the meal plan is $85 per day, per person (adults) and $42.50 for children under 12. For many years, villa owners at Villa La Estancia have expressed concern of the offering of an “all-inclusive” food and beverage option to both owners and rental guests. The all-inclusive option allowed for unlimited food and beverage at Villa La Estancia and the sister resorts, Villa del Palmar and Villa Del Arco, and was sold by The Villa Group, the management company (and food/beverage operator) that operates all three resorts. While many that purchased the AI option were respectful guests, there were at times those guests that took advantage of unlimited alcoholic beverages and, quite frankly, drank too much and caused disturbances for the staff, owners and rental guests. Many owners felt the over-consumption of alcoholic beverages was not in keeping with the high-end appeal of Villa La Estancia and after fielding complaints for several years, resort management made the decision to discontinue the AI option as of January 1st, 2017. This delayed date will allow for the gradual phase-out of existing AI commitments, made by OTAs (online travel agencies) and by villa owners renting out their villas. Effective immediately however, the on-site purchase of the AI is unavailable. Located downstairs from Cabo Wabo, Taco Loco is a great little taco stand/restaurant with great Baja fish tacos. TL doesn’t take credit cards, so that means it has pretty authentic food, right??? Taco Loco is a great place to hang out and people-watch. 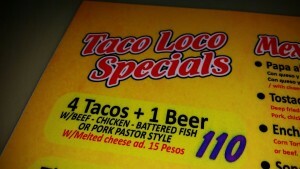 Four tacos and a beer for 110 Pesos (about US$7). Very reasonable pricing (all entrees are less than US$10) and excellent food. The margaritas are excellent and very, very strong. Located downtown, about two blocks west of El Squid Roe. OUR COMMENTS BELOW STILL APPLY: Cabo San Lucas is a culinary adventure and it would be a shame to limit yourself to just resort food. We’re often asked if the Villa La Estancia all-inclusive food/beverage option is available and/or worth purchasing. The resort offers an all-inclusive option for around US$115/day per person (see image, taken December, 2015). In our opinion, it’s not worth it for many reasons. Cabo San Lucas is a culinary adventure. There are so many incredible restaurants nearby (on the beach and in town) that it would be a shame to not experience them. They are just a walk or a short taxi ride away.While it’s convenient to have food and beverages available, they’re still available for purchase from any restaurant at the resort. There’s even a small mini-market on the premises, with fair pricing and a decent selection. However, we recommend stocking the condo with food and beverages by making a quick trip to Walmart, one mile away. They have a great selection of produce and the most incredible thick-cut Sonoran rib eye steaks we’ve ever experienced. The liquor selection is excellent, or there’s a liquor store (La Europea) in the Walmart complex. Walk over or catch the local’s bus, then hail a taxi to return to the condo with your groceries. Our visits to VLE typically begin with coffee and breakfast on the balcony, and lunch either on the balcony, poolside at the restaurant or a lunch at one of the several beach restaurants (a short walk down the beach). Dinner is almost always in town and we typically walk (20 minutes) and after dinner and a stroll downtown (or the marina), we then catch a $7 taxi back, tip included. 16.75 Pesos to the Dollar in November, 2015. Just a few years ago, it was 10.5 Pesos to the Dollar. What does this mean? Assuming a 150 Peso steak dinner, it used to cost about $14.25. Current price: $9.00. Mexico is an absolute bargain these days for visitors from the USA and Canada. 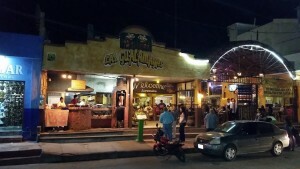 A very small and wonderful restaurant, located north of the main tourist street in Cabo. The flank steak is excellent, as were all the other items we tried. Only seven tables, so make a reservation if possible. This restaurant is VERY MUCH worth the visit. Note: no alcohol served, cash only. 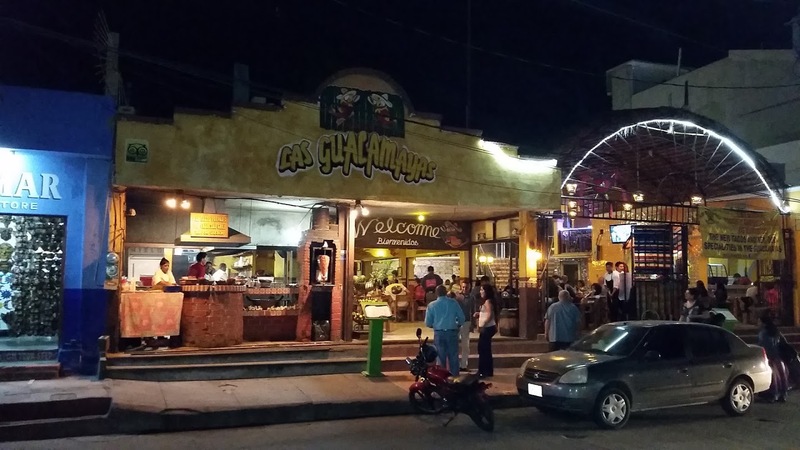 Police from La Paz to Cabo, and especially including Todos Santos have recently stepped up their efforts to shake down foreigners for money. People, do not feed them, you only make it worse for yourself and everyone else. If nobody gave them cash they would stop asking. When you are stopped, and you have made a boo boo, ask for a ticket and go down to the police station later on or the next day or the next week and pay it. They will take your driver’s license to insure you show up, and that’s ok. They do not want your license, as there is nothing they can do with it. Give it to them. You will get it back. If you have not pulled a bone head traffic infraction, just keep asking for a ticket. “Dar me un ticket, por favor”, if you want to be polite. Be polite but firm. If they threaten you or get nasty, (the police in Todos Santos are saying they will pick up the money later in the foreigners’ home and ask for your address, which is clearly calculated to frighten), write down their name, or if they are not wearing their name badge, (mandatory, but still they often don’t wear it when they are up to no good), then haul out your phone and take their picture. That’s like holding a mirror up to a vampire and they will jump in their car and scurry away like cockroaches. Guarantee, they will let you go with some face saving mumble like, “just a warning this time”. They rarely write tickets, and for sure they will not cite you when you haven’t done anything wrong. If you have broken the law, the ticket is ridiculously small. Man up and go down and pay it. OK, once more now, altogether, “dar may un teeket”. This police extortion would stop in a week if everyone would grow a back bone and stand up to them. These days your computer tattles to your search engine where you are. The search engines put you in a pigeon hole by reading your ip address, and here we are in the pigeon hole called Mexico. This is why when you try to use Google your computer forces you to use Google.mx. The Mexican version of Google, with nearly everything in Spanish. So you want to use good old Google.USA. but your computer won’t let you. If you’re not in Mexico yet, set Google as your home page and it will hold GoogleUSA in it for you. But if you’re already down here Google will no longer allow that. You can delete .mx until you’re blue in the face and you can’t get it to go to USA. Usually it works. If it doesn’t, try again in a little while. Personally, we’re not users of ATM machines. However, wanted to pass this on to those who may be tempted to use an ATM in Cabo (or Mexico). Caboholics posted this: If you are out & about in Cabo this week & find yourself shoulder to shoulder with some spring breakers, please inform them about the ATM’s on the street & the perils in using them, we were at the Wyndham dollar exchange yesterday getting peso’s & this young man stormed in unhappy with the 50 dollar service fee assessed to him for withdrawing money from the ATM there. We tend to just pay in US Dollars or convert them to Pesos at the Wyndham exchange or a bank (take your passport). Most Cabo restaurants also take credit cards.